Stephen and I have been looking forward to this wedding for quite some time now! Shawn&Lauren got married on the beautiful grounds at Lowndes Grove Plantation in Charleston South Carolina. We first met Lauren three and a half years ago in Florida at Jonathan&Erin's wedding. Lauren was a bridesmaid and getting an email several years later from her explaining her plans to get married in Charleston totally made our day. We love our TréCreative Family and awesome referrals like this! Being at this wedding felt like a little reunion seeing our past couple and their cute new baby. Shawn&Lauren met while attending the Medical University of South Carolina. They were put into small groups to get to know students from other programs and to chat about their different professions. Shawn first noticed how cute Lauren was and Lauren noticed Shawn's charm and whit, although neither of them had the guts to say hello at that meeting. Luckily for them, it doesn't end there. The University just so happened to be throwing an oyster party later that night where with some encouragement they introduced themselves. The rest is history and a little after three years these two were engaged. After moving several times together after school, they decided to plan a wedding in Charleston, where it all began. Charleston is filled with amazing restaurants and beautiful picturesque and historic scenery everywhere you turn. Guests came from all over to celebrate with these two as they became husband and wife. Shawn&Lauren were married on the front lawn looking towards the dock at Lowndes Grove and had a reception to follow on the back patio. There was a live band that entertained and kept the dance floor completely packed throughout the night, they were so talented and full of energy! Oysters were served during cocktail to remind everyone how Shawn&Lauren had their first conversation that brought us all together. The decor and decorations Shawn&Lauren chose for the reception were so beautiful. They tied in a nautical seashell theme with beautiful vases of white and blush floral arrangements all along the guest's seating tables. We feel so honored that Shawn&Lauren invited us to be a part of their amazing destination wedding day! We felt like family as we interacted with the bridal party and Shawn&Lauren themselves. Capturing everything in photos and video were one of the utmost important aspects of the day to Shawn&Lauren and we appreciate how they completely let us take the reigns with creativity and ample amount of photo time with them! Thank you so much Shawn&Lauren, we can hardly put into words how amazing your wedding day was. It will be one we'll never forget! 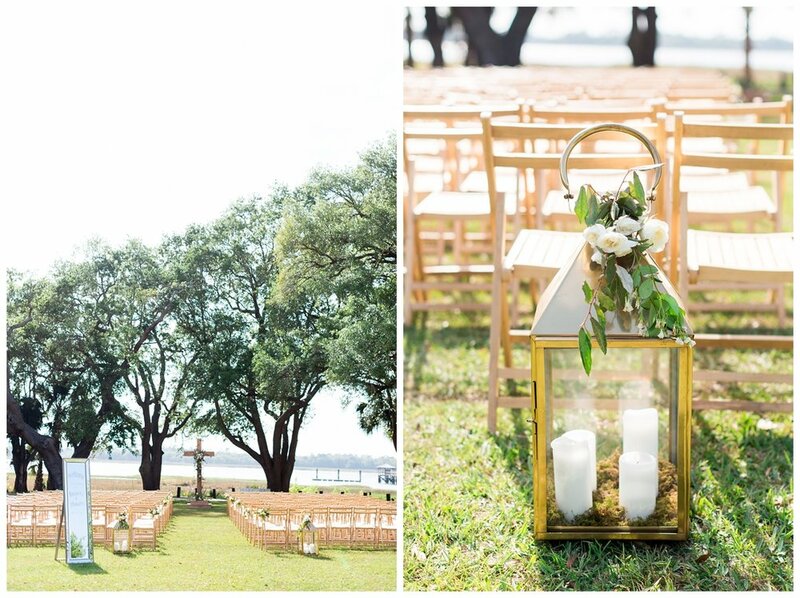 Enjoy some of our favorites from this gorgeous destination Charleston wedding below! 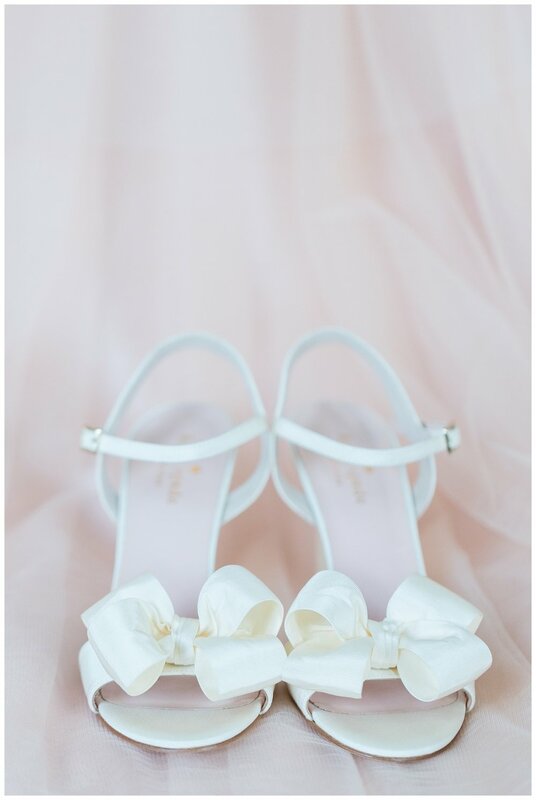 Lauren loves bows and her gorgeous gown perfectly matched her Kate Spade shoes with all the pretty bows! Shawn went classic for his attire, he wore his Navy uniform which looked stunning. Love these four so much! After the party they sailed away into the night!